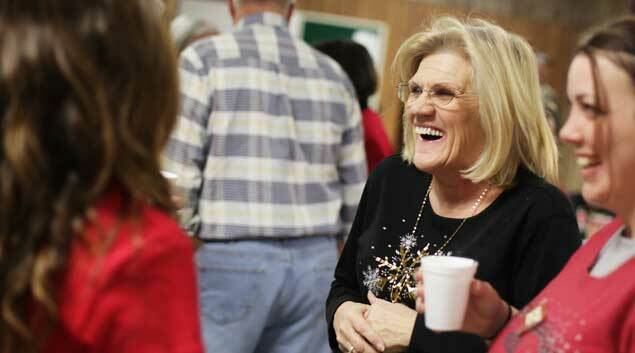 Jeanine Bezotte jokes around at the Exodus House Christmas party at St. Luke's United Methodist Church in North Tulsa on Dec. 14, 2011. Bezotte spent time in prison for drug crimes, but now works at Exodus House, which helps offenders transition into life after incarceration. Located on a Tulsa street mixed with working-class and substandard homes, Exodus House stands as a haven for people coming out of prison with nowhere to go. The property at 2624 E. Newton St. looks like a former motel but was used as temporary apartments for labor workers before it started to slide into disrepair, case manager Jeannine Bezotte said. It is a mission of the United Methodist Church and received its first resident in February 2002. It has been at the current location since 2007 and has a ratio of about half men and women as residents. There is not requirement for that ratio, it just happens to usually have that even split, she said. Unlike halfway houses and rehabilitation centers contracted with the Oklahoma Department of Corrections, transitional living housing centers are popping up as nonprofits and church ministries to help former inmates ease back into society. Of the women released from prison in the 2010 fiscal year, 46 percent were not under any required supervision. They receive their possessions and a ride to a bus station if no family picks them up after being released. Some women choose to live in the nonprofit and faith-based transitional living centers rather than return to their homes and neighborhoods where they were before incarceration. Along with Exodus House, other transitional living centers in the Tulsa area include Wings of Freedom, New Life Homes, Life Gate Homes and His Home in Claremore. Some residents opposed Exodus House moving into the neighborhood, said the Rev. Virginia Gray, volunteer coordinator and spiritual advisor. The neighborhood had been dealing with issues of violence, drugs and abandoned properties, and people worried that former felons would add to those problems, Gray said. Community meetings were held to explain the program, and residents moved in slowly. Eventually, the neighborhood experienced improvements as city codes started being enforced more, leading to the removal of substandard homes and cleanup of several properties. The annual budget for Exodus House ranges between $89,000 and $100,000, with a heavy dependence on donations and volunteers from area churches. Most of the volunteer transitional living programs are managed and staffed by former inmates, such as Bezotte. Bezotte, 59, had been a drug and alcohol abuser since her teenage years, with a long criminal history in other states. She has two children, who are now adults. She was physically and sexually abused as a child, grew up in a troubled home with an absent father, and married at age 16. While living in about six other states, Bezotte estimates she was arrested about 100 times on drug-related offenses, with sentences never amounting to much time. After arriving in Oklahoma, she was arrested in Sapulpa in February 2001 for manufacturing methamphetamine. Seven charges were filed in Creek County including manufacturing, maintaining a home where drugs were used and sold, possession of drugs within 2,000 feet of a school and having meth-making ingredients in the home. Bezotte pleaded guilty in October 2001 and received 20 years for all the charges, with 15 of those years as a suspended sentence. Her fines totaled more than $30,000. In prison, she participated in some faith-based programs about independence and sobriety and started attending substance-abuse counseling and support groups. “It didn’t matter whether it was religious or not, it was something to do,” she said. After her release in 2006, she entered Exodus House and worked by cooking hamburgers at a restaurant. “I was here two to three months before I really got it,” Bezotte said. “You see all these people doing things for you, and it’s hard to believe. I was thinking they will want something in return like cleaning their house or car. But that never happened. She later found work as a hotel night clerk and at a discount store. Staying involved in prison ministry, she was hired as an administrative assistant at Operation Hope then started work in Exodus House, moving up to case manager. Bezotte is working on a pre-social work degree from Tulsa Community College and continues to go to counseling. At Exodus House, Methodist churches adopt a room and supply it with everything from the bed to the food in the pantry. Residents who graduate from the program are able to take everything with them to start their own home. The churches are also adopting the person, who is required to attend the host church at least once a month. Rules are strict: get a job, go to treatment, have no visitors except approved family members, abide by a 10 p.m. curfew, submit to random drug tests, do chores and complete community service. The program has zero tolerance for drugs, alcohol or anything illegal. Having three infractions is grounds from termination from the program. Since 2002, 50 people have graduated from Exodus House, out of the 96 who entered the program. Of the graduates, eight have returned to prison, but none in the past five years. Capacity is 10, and residents stay from six months to a year. Bezotte and a facilities manager live in apartments adjacent to the building, which is nearly always full. The program receives eight to 10 applications a month from current inmates making plans for their release.